Tessa is a fourth generation Montanan, and was raised in Plains, Montana. She attended the University of Montana, and graduated with high honors with Bachelors Degrees in English Education and Spanish. Upon graduation she taught at an alternative high school. Tessa then attended law school at the University of Oregon. 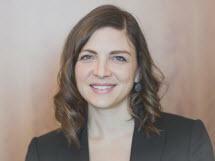 While in law school, Tessa worked for the Oregon Department of Justice, the public defender's office, Judge Ann Aiken in United States District Court for the District of Oregon, and legal aid. She also served as Articles Editor for the Oregon Law Review. After graduation, Tessa returned to Montana to clerk for Justice Laurie McKinnon at the Montana Supreme Court. Tessa joined GLR in 2014 and practices a wide variety of general civil litigation, including immigration and employment law. Tessa is admitted to practice in Montana State Court and the United States District Court for the District of Montana. Outside of work, Tessa enjoys taking advantage of Montana’s trails, lakes, and rivers with her family and friends.